A BUBBLING CAULDRON: HOW DID THEY DO THAT?! 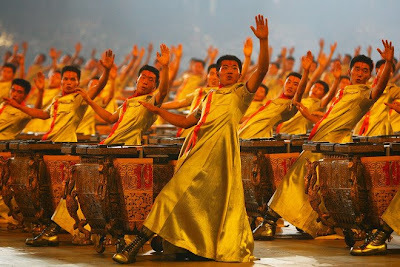 I don't know about you, but I was mesmerized by the opening ceremonies at the China Olympics Friday night. In my lifetime I've never seen such a display of precision as was demonstrated in the choreography of those events. I was particularly impressed by the 2008 drummers who, regardless the camera angle used, were in sync, on beat and simply magnificent. It seemed at times as though the sweat was falling from their brows in unison! Those displays of excellence got me thinking about what is possible when you get people all pulling together toward a single goal. It's certainly something I'm going to be giving a lot of thought as we now launch into our campaign season. I'm going to be interested to observe the various candidates to see which ones, if any, come across as true consensus builders. There has been so much rancor on the dais for the past half-dozen years that electing persons who will work hard to provide solutions to the many issues we face that meet the needs of all our residents, not just a favored few, will be important to me. I'll write more about that later. ANY MORE SHOES TO DROP? In the meantime, we'll all just hold our collective breath to see if anyone else comes out of the woodwork as a late added starter since the deadline has been extended a few days because Linda Dixon chose to leave the dais next year. Several months ago I provided a link to La Femme Wonkita, a blog authored by former mayor Sandra Genis. Following a very moving initial posting, she's provided new entries only sporadically. However, over the past week or so she's returned with a vengeance. I encourage you to slide your cursor over to the right side of this page, scroll down to her link and take a peek.